It was a massive leap for Ducati to abandon its sporting V-twin engine and instead create a whole new dynasty of V4s. Not only has the firm turned its back on nearly half a century of V-twin development, it’s also called time on a motor that has given the firm 14 World Superbike titles and put the Bologna manufacturer on the worldwide map in terms of sporting success. 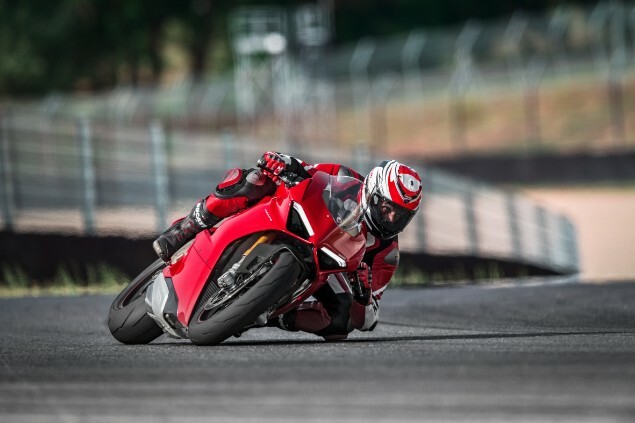 The V-twin is as much ingrained in Ducati DNA as the colour red however, when you ride the new Panigale V4 S, you could be forgiven for thinking nothing has changed. Changing to a V4 engine configuration has as much to do with performance as it does with new legislation that governs noise and emissions controls. Motorcycles are currently governed by the relatively strict Euro4 regulations, limiting the sound the engine can create in terms of both mechanical noise and combustion noise that coming from the exhaust pipe. Large capacity, high compression V-twin engines with lots of valve overlap are much harder to make legal than four-cylinder engines; hence Ducati using the V4 from now. All of this gets even more demanding with Euro5 which comes in at the start of 2020 where the control of unburnt fuel leaving the exhaust gets even stricter. Ducati can combine enhanced performance with easier control of the emissions with a V4. Ducati will almost certainly have other plans in mind for this V4 engine as making an all-new engine for one model makes no financial sense. They aren’t saying anything about this officially at the moment but over the coming years it would be no surprise to see the V4 family of bikes expand significantly to include bikes with less of a high performance focus. Onboard the all-new Panigale, with the engine ticking over, all your senses tell you there’s a V-twin between your legs. Your ears hear the lazy thump, thump, of a twin and there is even a bit of a mechanical rattle, which is exactly what you expect to hear on a sporty Ducati model. It’s not a dry clutch clatter, more a pleasing bit of noise to reassure you there is a motor built without too much heed to noise regulations. And the same could be said for the exhaust note, which is spot-on in terms of a traditional Ducati low drone. But there isn’t a V-twin below you, there is a V4 and as soon as you let the clutch out you know you are riding something a little bit different. Even from relatively low down the rev range, where a V-twin would be juddering and protesting, the V4 remains ultra-smooth without even the smallest hint of a judder. You can trundle through town at 30mph on the V4 with the rev counter registering under 4000rpm on the lovely full-colour TFT (Thin Film Transistor) dash and not feel the need to continually slip the clutch. 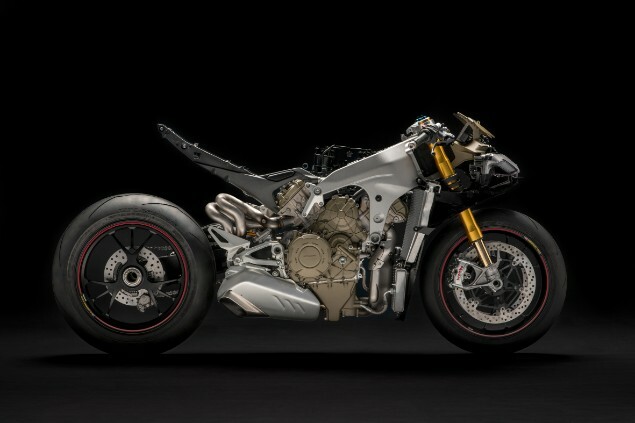 It’s remarkable and such a transformation from the V-twins of old or even the engine’s final incarnation, the 1299 Panigale. This is a Panigale model that can happily be ridden slowly without it angrily demanding to be let off its leash. But where’s the fun in that? Time to let the Panigale V4 loose of its restraints. On the open road the V4’s performance is quite simply breathtaking. You can’t call it fast, that simply doesn’t do justice to the acceleration that 211bhp and 91.5ftlb of V4 delivers. 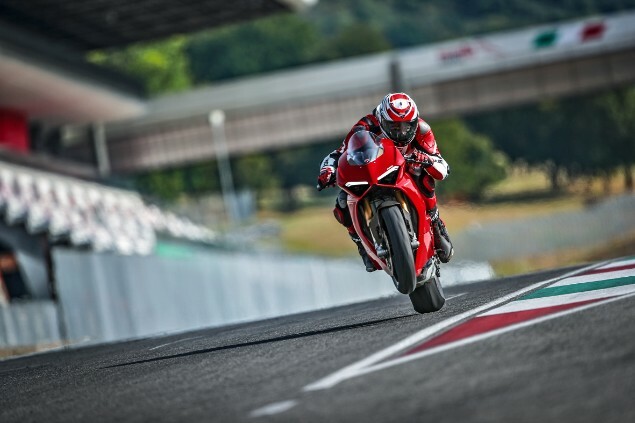 With the throttle open the Panigale builds up speed so quickly that you struggle to feed it gears fast enough, despite the super-slick quickshifter speeding up the process of upshifting. It’s a case of accelerate, hold on tight and just keep banging the gear lever until your bottle goes or the speeds reach a point when you fear for your licence. This is one insanely fast bike, however by the same token it is also one that isn’t always begging to go mad. One of the major faults with the older 1199 Panigale models was their light switch power, which lacked bottom end but went bonkers at the top end. Ducati went a long way to correcting this with the gutsier 1299 Panigale, but the V4 is light years ahead in terms of refinement. Just like at 30mph, you can ride the Panigale V4 at legal speeds effortlessly and while the riding position is a touch aggressive, it’s not stupidly so. We wouldn’t say it’s a sports tourer, but it certainly isn’t as torturous as an older 916-style of Duke in terms of rider comfort. The biggest eye-opener on the V4 isn’t the engine’s outright performance, but the way it seamlessly links with the bike’s staggering array of electronic assists. On the V4 S you get just about everything possible in terms of electronics – semi-active suspension, traction control, anti-wheelie, cornering ABS, slide control, power modes, an up and down quickshifter – the works and without these the V4 would be a very different beast. You wouldn’t want to ride the V4 in the wet with the electronics switched off as this is a fearsomely powerful bike that will happily overcome the rear tyre’s traction. And it’s the same on dry roads with a cold tyre. However by arming the V4 with such impressive electronics you never feel intimidated by the power as they work to ensure the bike’s performance is accessible to all riders, not just those who can line up on a MotoGP grid! When you accelerate hard the anti-wheelie and traction control keep it all wonderfully under control and should the front lift, it’s brought gently back to the ground with minimal fuss. As you would imagine, the V4’s unique chassis is developed to win WSB races (next year a 1000cc WSB-legal R version will be appearing ready for the 2019 season) and on the road it is sublime. The S model’s semi-active suspension delivers a firm yet controlled ride and while you really need a dry track to discover its true abilities, on the road it is more than happy to ride around well within its design envelope. The ABS system is excellent and the Brembo brakes remarkable in terms of power and feel. 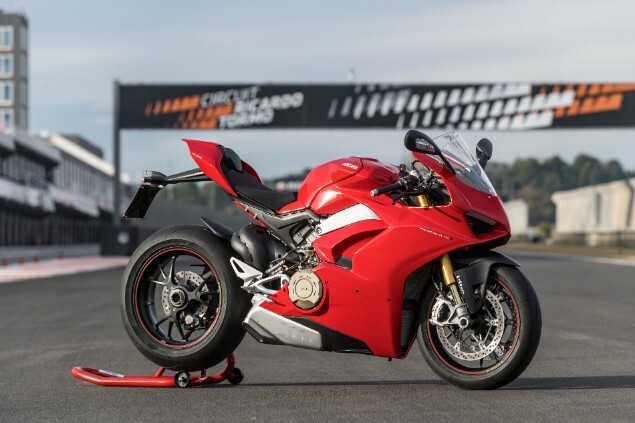 But it wouldn’t be a Ducati if it didn’t have a few faults and true to form, the Panigale V4’s mirrors vibrate and the ultra-trick dash is lacking a fuel gauge. But in all honestly, that’s all we can find to moan about with this bike. Of course some will lament the death of the premium Ducati V-twin sportsbike (the 959 Panigale will still be around for a while), but once you have experienced a V4 you will never look back. Ducati claim their MotoGP bike and V4 road bike motors share many similarities, however while they have the same 81mm bore, the road bike’s 1103cc takes it above MotoGP’s maximum engine capacity limit, so the racer has a shorter stroke to take it to under 1000cc. That said, both are 90-degree V4s that run counter-clockwise and have (or had, this may no longer be the case in MotoGP, Ducati won’t confirm anything) a twin-pulse firing order. Interestingly, while the road bike’s rev limit is 14,000rpm, the racer’s is a stratospheric 21,000rpm – allowing it to make over 250bhp! The Panigale V4 runs a ‘twin pulse’ firing order to simulate the feel, sound and power characteristics of a twin. The first cylinder to fire is the front left, which is followed 90-degrees of crank rotation later by the rear left cylinder. There is then a gap of 200-degrees before the front right fires and then, 90-degrees later, the rear right.